In this section, it is described how external INFN users can access Internet by connecting to LNF wireless network. 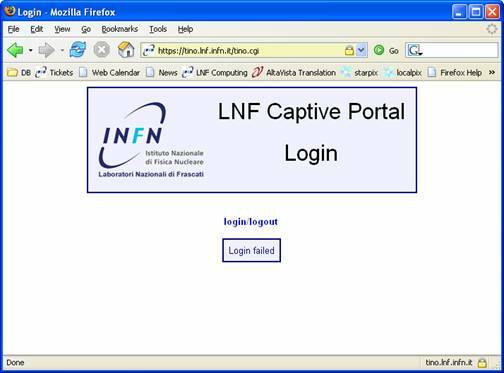 In this case, the authentication consists in typing UserId and Password provided by LNF secretariat to guests or in the use of INFN certifies. 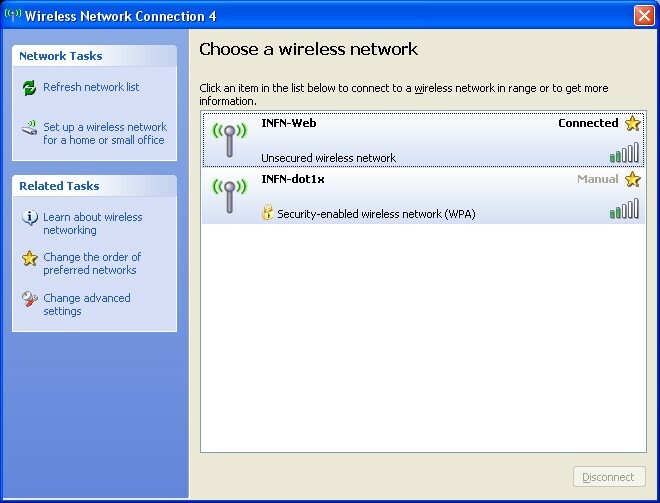 After enabling wireless device, right click on system tray icon for wireless connection as in next figure. 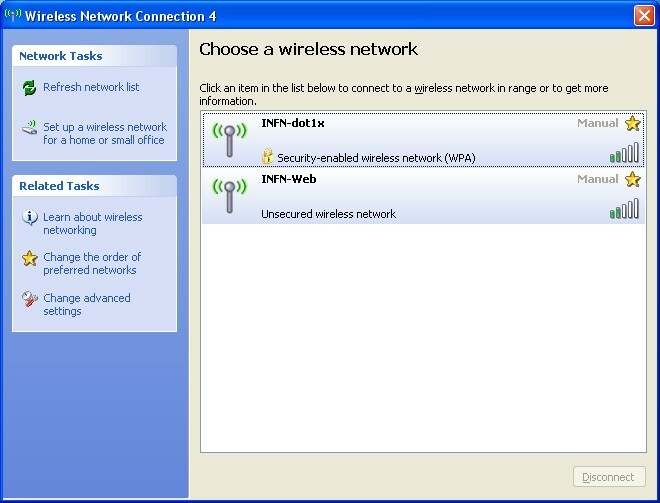 Now in the menu opened, select View Available Wireless Networks. A window very similar to the one shown in the next figure will appear. 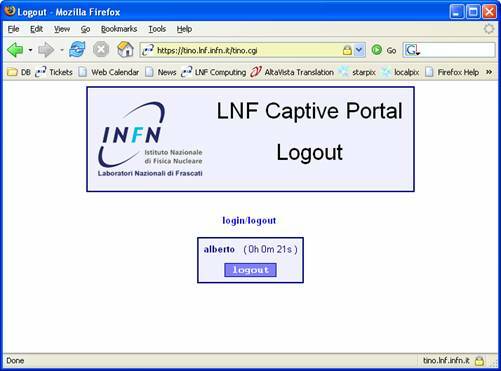 Double click on INFN-Web network. If previous operations were successful, a connection to INFN-Web wireless network will be available. Now the panel of figure 2 should be very similar to the one of next figure. Open your browser, for example Internet Explorer or Mozilla Firefox. Instead of usual home page, the web page shown in next figure will appear. 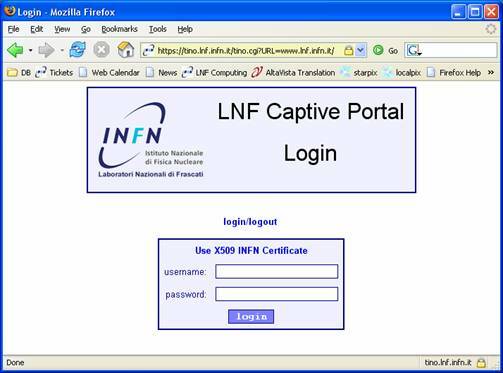 Now insert proper credentials and click login button, or, if you have an INFN certify and you correctly registered it, you can authenticate clicking on label “Use X509 INFN Certificate”, without inserting any credentials. Whether credentials are correct or the certify placed on your system is valid, the web page shown in next figure will appear. Now it is possible to access Internet. Whether your credentials aren’t correct or your certify isn’t valid, the web page shown in next figure will appear. Access to web page https://tino.lnf.infn.it/tino.cgi. The browser will show a window very similar to the one of the next figure. If this action was successful, the web page shown in next figure will appear.